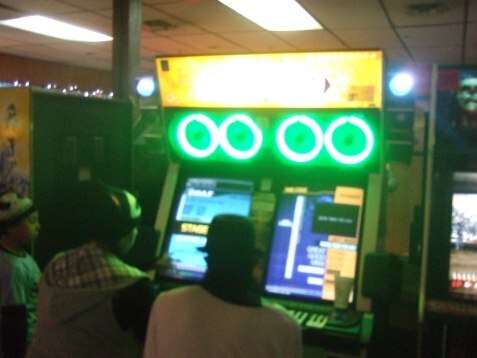 8 on the Break is one of the few dedicated arcades in the Northern NJ/NY area, outside of Chinatown Fair in Manhattan. Nestled amongst nail salons and Chinese food joints in Dunellan, NJ (not terribly far from New Brunswick), it's an unassuming hole in the wall joint. 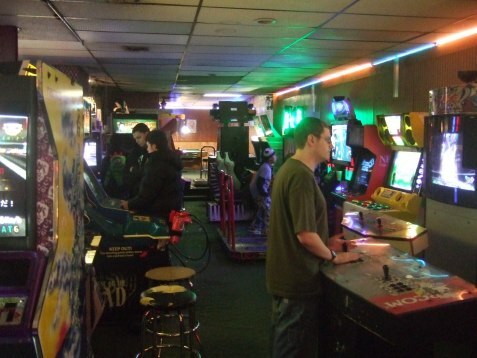 The main reason why this place still exists while so many of its fellows have died off is because it caters to the few audiences that go to arcades anymore - namely, fighting and rhythm game fans. (I feel like it's more on the latter than the former, although they run competitions for both.) It's been about five years since I went down there last, mostly because they had just gotten in Guilty Gear Isuka before it hit the consoles (what a disappointing trip that was) but last weekend I decided to check it out and grab some pictures. Probably the coolest thing here was this full size Samba de Amigo machine, which is the only time I've ever seen one. It's the revised Ver. 2000 with the extra songs and hustle mode, which got a console release for the Dreamcast in Japan but not the USA. It's nice to play on the "real" maracas - I used to have bootleg ones for the Dreamcast, which were light and cheap, and have since broken. 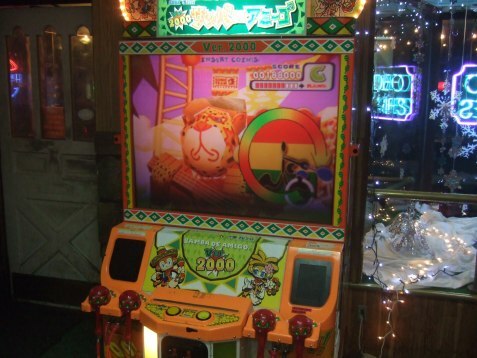 The sensors on this machine were still a bit off, though - even holding them parallel, the game registered one being slightly higher than the other. No biggie, because Samba de Amigo really is more about wacky flailing than precise maraca shaking. You can't see because of the brightness, but this is a Keyboardmania game. Five key Beatmania is far too complicated for me, so there is no way I could ever succeed at these. 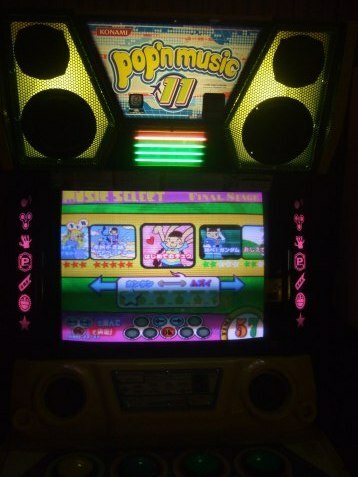 Pop'n Music is a bit more on my level, since it's basically Beatmania-lite, with large buttons and bright, cute characters. It's the first time I've seen a real cabinet, and first time I've played it outside of Otakon's gameroom. This version had a few songs from the Dragon Ball anime, and random stuff from old Konami games, including Gradius and The Goonies. I didn't take a picture of it, but there was also a proper Beatmania somewhere off in the corner, as well as at least two DDR/Pump It Up style games. This is some sort of new DJ Max game that seems a bit like Ouendan/Elite Beat Agents, played with a full size touch screen. It was hoarded the entire time I was there so I didn't get to try it out. The fighting games included Tekken 5: DR, Tekken 6:BR, Tatsunoko vs. Capcom, and the new BlazBlue Continuum Shift. There were also two Street Fighter III: Third Strike cabinets, arranged perpendicular to each other, and each missing a joystick. 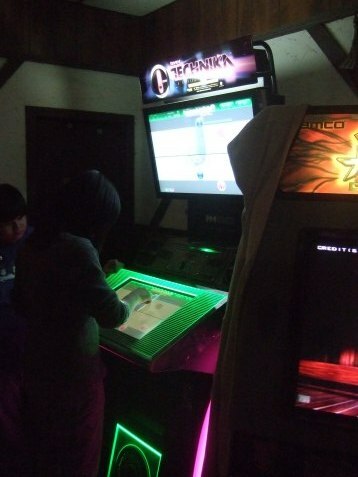 They were networked together, which made for a weirdly Japanese-style arcade experience, where you can't directly see who you're playing against. 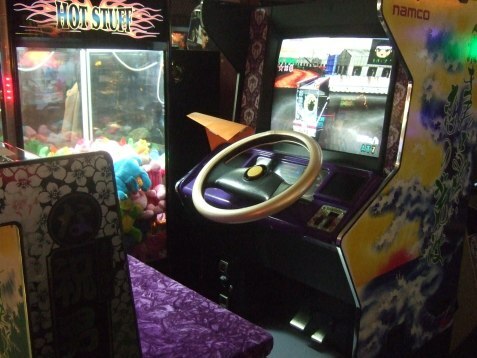 There were a couple of racing games too, like one of the Initial D games, and Wangan Midnight Maximum Tune 3, which I only previously knew through Yuzo Koshiro's excellent soundtracks. Then there's this weird old truck driving game from Namco, sort of like Sega's 18 Wheeler, except instead of piloting through the highways, you're weaving through a typical claustrophobic Japanese neighborhood. If you're going there for retro stuff, you'll probably be disappointed. They had a total of three Neo Geo cabinets, one of which was four slot, and a Bubble Bobble cabinet. And Point Blank, if that counts as retro, and Jambo! Safari, a ten year old Sega game that was just recently ported to the Wii. There was also a bootleg MAME cabinet called Blue Elf which had nearly the full library of Capcom and SNK games, but the hardware was completely insufficient to run anything at the proper speed. Playing Progear at roughly 80% speed makes it quite a bit easier, but the many fighting games on there are all but unplayable. 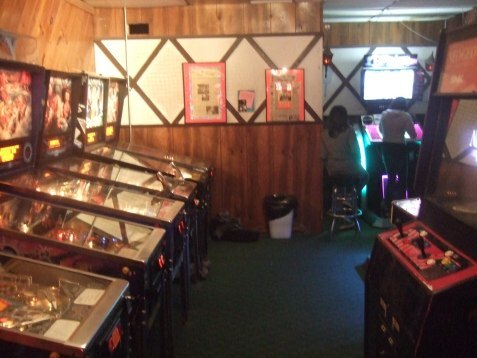 There's also a whole small room devoted to pinball games, which I didn't play. The whole place doubles as a pool hall (hence the name), so there are a couple of tables in the back, which is much roomier than the crowded arcade area. Anyway, beyond these pictures, you can check out the website, which is a bit outdated and doesn't quite list their current games - Melty Blood is no longer there, for instance. They have plenty of organized tournaments too. It's a neat little place to visit just because it's astounding that a place like this has managed to stay in business, and shows that an arcade is still viable if you know how to do it right. It's also pretty easy on the wallet - most of the fighting games, at least the ones I played, were only 50 cents each. Not bad at all. 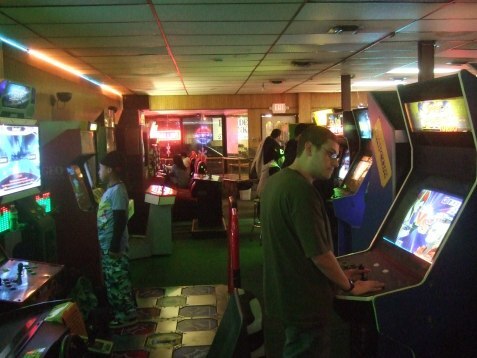 I miss arcades. Too bad they are pretty much extinct where I live. It is nice to see a good arcade left standing. Sounds like a pretty nice place. I've heard the latest DJ Max is really great, at least a interesting use of big touchscreens, shame I'm not likely to ever play it. Also worth mentioning 8 On The Break is(or was, rather) the official test site for In The Groove 1 & 2, and is mentioned in the credits. Test location for itg1, itg2, piu pro, piu pro2, dj max technila 1 & 2 as well as friction shooting game because the owner of the break is involved with manufacturing all of those games and uses the break as a test location. "They were networked together, which made for a weirdly Japanese-style arcade experience, where you can't directly see who you're playing against." Actually, it's easier to see your opponent, because the machines are situated around a corner - so they're more in front of you than if you were side-by-side, where you could only see them in your peripheral vision.